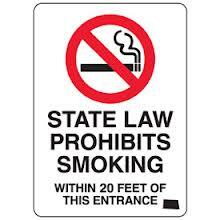 A new North Dakota Smoking Ban went into effect December 6, 2012, banning smoking in all indoor workplaces. A previous law had a limited ban. According to news outlets, the new law (passed by voters in a November election) approximately one month ago expands to almost all public places and most workplaces, including public transportation, cabs, private nursing homes, motels, and bars. Smoking within 20 feet of an entrance to any public building is now against the law. Individuals who break the North Dakota smoking law will incur fines of $50. If a bar in N. Dakota does not comply, they may have their liquor and tobaccos license revoked. The impact of the new law will affect everyone from business owners, occupants, and visitors to residents. Because the law bans indoor smoking, smokers will be required to smoke outdoors. In order to keep facilities clean, safe and professional looking, fire safe North Dakota smoker’s posts and receptacles will be needed around the State to keep cigarette butts contained and smokers organized in designated smoking areas. If you are a Glaro Inc. dealer/distributor or any other dealer, many facilities owners in North Dakota are likely in search of smoker’s posts. You can assist them by reaching out and helping them solve the statewide smoking management issues they are currently facing. It is a great opportunity for you and a great solution for North Dakota.